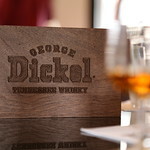 In March, I had the honor of traveling to Tennessee to visit the George Dickel Distillery. Visiting a distillery and seeing the process, place and people first hand gives me a much deeper understanding of a spirit than marketing materials, buying a bottle or even a guided tasting can. Touring the Dickel Distillery in Cascade Hollow drove home one fact. “Handmade the Hard Way” is far more than just a slogan for all of the people involved in making Dickel whiskies. It is truly a way of life. Driving to the distillery, which lies about an hour’s drive southeast of Nashville, you leave the city and its surroundings and then almost immediately plunge into rolling hills, grassy meadows and dense forests. As you get closer to Cascade Hollow, your surroundings change to pastures and farm land surrounded by dense wooded areas. Looking at the aerial maps (thanks Google) you can clearly see where the forest has been cleared away to make room for that pasture and farm land. Thinking about it, you start to get an idea of what the area must have looked like in the 1860’s when George Dickel first visited. Tucked back in a valley, it’s easy to see why he chose Cascade Hollow as the home of his namesake whisky distillery. In the 1860’s, George Dickel was a prosperous merchant in Nashville with interests in shoemaking, orchards and most notably liquor wholesaling. Legend says George Dickel and his wife visited Cascade Hollow in 1867 on a vacation from Nashville and established the distillery shortly thereafter in 1870*. 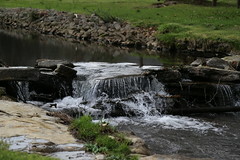 Having found a spring near the site of the distillery there was an abundant source of pure water for whisky production. 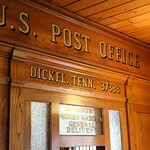 Dickel quickly began production of his namesake whisky, which he insisted was on par with any of the more famous Scotch whiskies and, to show that fact, insisted on dropping the ‘e’ from whiskey. 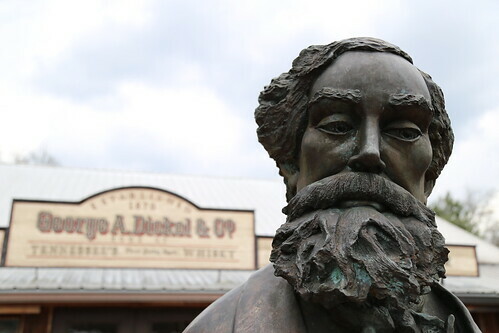 George Dickel died in 1894 and oversight of the distillery and other businesses passed to his wife Augusta. She ran the distillery with George’s long-time business partner until Prohibition changed everything. Prohibition hit Tennessee earlier than the rest of the country when the sale of alcohol was prohibited in 1907. Ten years later (and 2 years before the rest of the country), the possession of alcohol was also made illegal in TN. This put an end to distillation at Cascade Hollow for over 40 years. In the late 1950’s the Dickel distillery was rebuilt on the old Cascade Hollow site. Ralph Dupps took over operations at the distillery and the old recipes were shared by distillers who had made the whisky in years past. Operations haven’t changed much since then as I was soon to find out. Like every distillery, the water used to make the George Dickel line of whiskies is essential to the flavor profile they’re looking for. 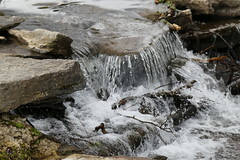 When first scouting the area George found a spring not far from the site of the current distillery. This is where he established his original operation as it wasn’t worth it to transport the water down the valley. The distillery now uses the same water source but pipes it down from the mouth of the spring. In addition to providing what is possibly the most important ingredient in the whisky, the spring also feeds a picturesque little stream that divides the distillery proper from the visitor’s center. Dickel uses a mash bill consisting of 84% corn, 8% rye and 8% malted barley. All of the corn is sourced from Tennessee and the rye and barley sourced from as close as possible while maintaining the quality the distillers require. I had always wondered why so many whiskey recipes call for malted barley and Allisa informed us that without malted barley your mash will lack an enzyme that assists with the fermentation. 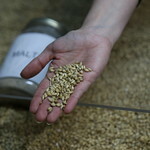 You can add the enzyme, but at Dickel they find the barley also contributes to the flavor profile they’re looking for. The grains are milled on site in a hammer mill and combined in succession during the mashing process. It was interesting to see that the grain is weighed manually in a huge balance above the mash tubs and recorded, also by hand, in a paper ledger. 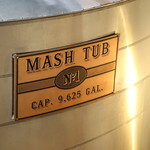 Dickel leverages the sour mash process in a pair of 10,000 gallon mash tubs which, all told, takes about 4 hours. After the mash process completes the two tubs are combined into one of nine 20,000 gallon fermenters. Into each fermenter the distillers pitch Dickel’s proprietary strain of yeast and begin the fermentation. It’s somewhat odd, I’ve been on quite a few distillery tours and I’ve only ever seen the yeast once. 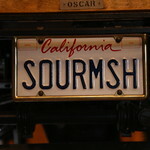 It’s one of those secrets that distillers generally keep to themselves. Dickel was no different in that respect. 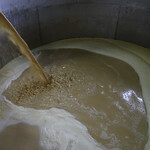 Fermentation is a 3-4 day process and is, not surprisingly, monitored by hand or rather, taste, smell and temperature. Once fermentation is complete, the distillation can begin. The first distillation of Dickel whisky is by way of a ~30ft column still. This brings the spirit to a proof of 110-115. From there it goes through a “doubler” which brings it to a final proof of 125-135. 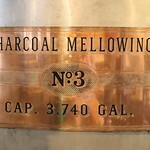 Next comes Dickel’s signature charcoal mellowing process. But first the whisky is brought down to 40 degrees F. I asked why, thinking it strange that they’d spend the time and energy for this step. Allisa explained that George Dickel produced whisky year round, but for reasons he couldn’t explain found that whisky made in the colder winter months tasted better. This chilling process is what became of George’s findings. Does it have an impact, I can’t say, but there are certainly chemical changes that occur or are inhibited depending on temperature, so there is probably some merit there. 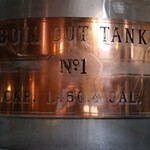 Once chilled the whisky is poured into the mellowing tanks. In these tanks is 10-13 feet of maple charcoal bookended by stainless plates and wool filters. Upon entering the mellowing tank the whisky will take 7-10 days to fully move through the charcoal and come out the bottom. This is, hands down, the longest part of the distillation process. But, tasting their rye really showed me the value of this process. Compared to very similar ryes (same mash bill, age, producer) that hadn’t been mellowed, the Dickel rye was smoother and had much less bite. Oh yeah, those mellowing tanks, they’re filled by hand, bucket brigade style, one bag at a time. Dickel whisky, once mellowed, is barreled by hand (no surprise there), two barrels at a time and transported up the hill to the warehouses. 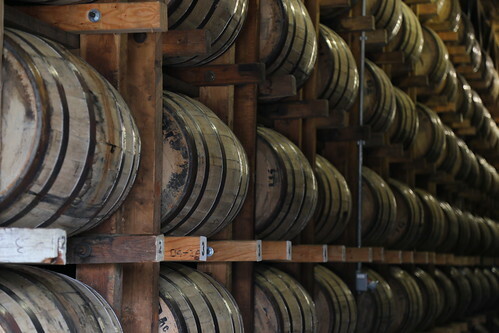 Dickel has 11 original warehouses which store 13K-15K barrels each and a brand new warehouse that can hold 52K. Each of the original warehouses is a single story. Barrels are racked 6 high and 27 deep. Touring a barrel house like this is really an amazing experience. The smell alone makes you want to never leave the place. It’s an aroma of wood, moistened with whisky and the undeniable feeling of age. Hard to explain and even harder to forget. 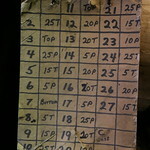 As we were walking around we asked about a hand written cardboard chart hanging from one of the racks. Allisa explained that since the barrels go 27 deep and they get there by rolling over and over, this chart indicates where the bung on the barrel needs to start so that when the barrel stops rolling the bung will face up and not leak. 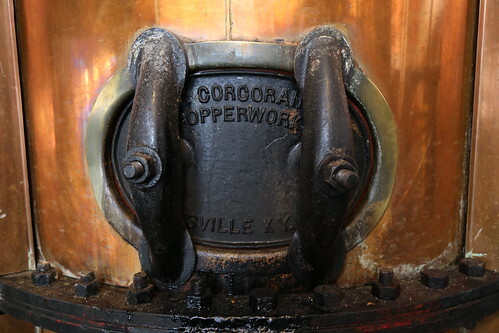 It’s these touches that we saw throughout the distillery that kept hammering home that “Handmade the Hard Way” slogan. Dickel whisky isn’t aged to become a specific bottling from the start. Instead barrels are sampled throughout the aging process and it’s then decided if they’re on their way to flavor profile of Number 8, Number 12 or possibly Barrel Select. There is even rumor of some “older stuff” having recently been discovered. 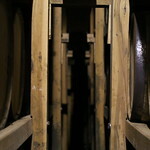 Fingers are certainly crossed for some more of the older hand selected barrel or even something else interesting. One bit of math before I move on. Assuming the new warehouse isn’t used yet, that gives Dickel 11 warehouses with, conservatively, 12K barrels each. That’s 132K barrels. If each holds about 52 gallons of finished whisky, that multiplies out to 6,864,000 gallons of whisky being aged at any given time. That’s about the capacity of 10 olympic size swimming pools or a pond 500 feet in diameter and 4.5 feet deep. Best. Water. Feature. Ever. 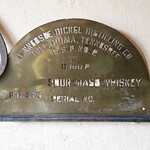 Through the day at Dickel there were constant reminders of their slogan or, rather, the way they live their life and make their whisky. It was interesting to hear that they had recently switched to two shifts but could quadruple their current production without having to change the process too drastically. With a giant parent company like Diageo they could easily be forced to make changes but Allisa assured us that Diageo appreciates Dickel’s handmade qualities and that Dickel has “a lot of room to grow and stay the way we are”. PS – The rest of the pictures are in this Flickr album if you’re so inclined. * There are other stories, but I rather like this one. 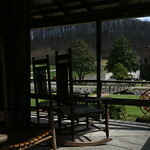 † The George Dickel Distillery paid for this trip (as mentioned). As such, it falls under my sample policy. If you’re wondering what that means check out my sample policy. Sounds like an amazing trip! I would definitely love to tour a distillery like this to see the process. Thanks for sharing! Sounds like you had a great time. 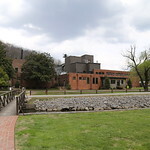 I’d love to visit the George Dickel Distillery if I’m even in Tennessee.